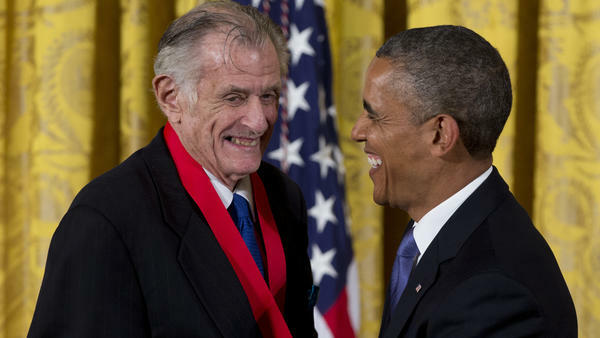 President Barack Obama laughs with Frank Deford as he awards him the 2012 National Humanities Medal for transforming how we think about sports, during a ceremony in the East Room of White House on July 10, 2013. 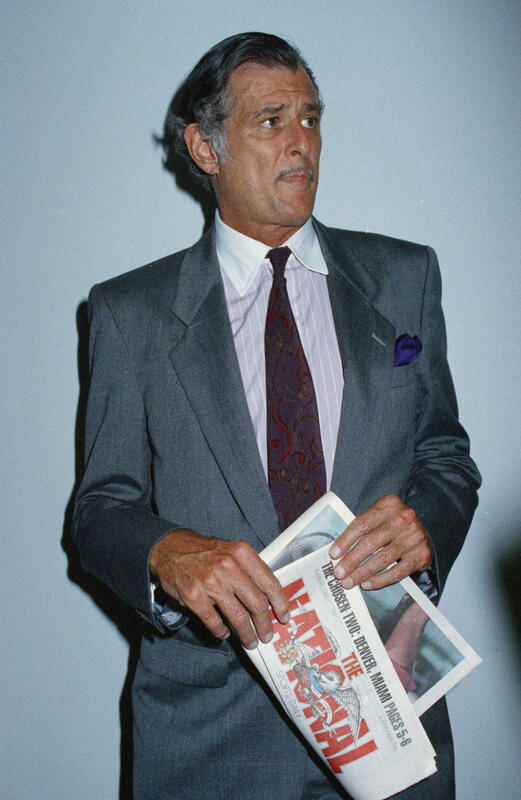 Frank Deford on June 12, 1991, holding a prototype of the final edition of The National, a sports daily where he served as editor in chief from 1989-1991. Ladies and gentlemen, boys and girls, children of all ages! I always wanted to use that in a commentary, that wonderful circus introduction ballyhooed by the splendid ringmaster, but I could just never find the ideal spot. Of course, had I, there would've been some people who'd say that a circus doesn't belong in with sports. But, hey, just because there's clowns around doesn't disqualify certain daredevils from being certified athletes ­­-- equestrians, tightrope walkers and those who fly through the air with the greatest of ease. That's why I was so upset to learn that the grandest big top ever — Ringling Brothers, Barnum and Bailey — was going out of business later this month. The Greatest Show on Earth — and it probably was exactly that once upon a time. Well, by coincidence, this particular tiny show on earth that consists entirely of me talking about sports on NPR is also folding its tent flaps this May of 2017. Yes, this is my swansong, my farewell, my last hurrah. Adieu, adios, arrivederci, auf wiedersehen. I've been delivering these little homilies since 1980 — that's 37 years — and altogether, NPR statisticians tell me, my bloviation total is 1,656 commentaries — and I trust you've hung onto every word. I have survived so long because I've been blessed with talented and gracious colleagues, and with a top brass who let me choose my topics every week and then allowed me to express opinions that were not always popular. Well, someone had to stand up to the yackety-yak soccer cult. And perhaps just as important, I've been blessed with you, with a broad and intelligent audience — even if large portions thereof haven't necessarily given a hoot about sports. Nothing has pleased me so much as when someone — usually a woman — writes me or tells me that she's appreciated sports more because NPR allowed me to treat sports seriously, as another branch on the tree of culture. Thank you for listening. Thank you for abiding me. And now, Ladies and gentlemen, boys and girls, children of all ages, I bid you goodbye, and take my leave. Our sports commentator Frank Deford has some news this morning. FRANK DEFORD, BYLINE: Ladies and gentlemen, boys and girls, children of all ages. I always wanted to use that in a commentary, that wonderful circus introduction ballyhooed by the splendid ring master, but I could just never find the ideal spot. Of course, had I, there would have been some people who'd say that a circus doesn't belong in with sports. But, hey, just because there's clowns around doesn't disqualify certain daredevils from being certified athletes - equestrians, tightrope walkers and those who fly through the air with the greatest of ease. That's why I was so upset to learn that the grandest big top ever, Ringling Brothers Barnum & Bailey, was going out of business later this month. The Greatest Show on Earth, and it probably was exactly that once upon a time. Well, by coincidence, this particular tiny show on earth that consists entirely of me talking about sports on NPR is also folding its tent flaps this May of 2017. Yes, this is my swan song, my farewell, my last hurrah - adieu, adios, arrivederci, auf wiedersehen. I've been delivering these little homilies since 1980. That's 37 years. And altogether, NPR statisticians tell me my bloviation total is 1,656 commentaries. And I trust you've hung on to every word. I have survived so long because I've been blessed with talented and gracious colleagues, and with a top brass who let me choose my topics every week and then allowed me to express opinions that were not always popular. Well, someone had to stand up to the yackety-yak (ph) soccer cult. And perhaps just as important, I've been blessed with you, with a broad and intelligent audience, even if large portions thereof haven't necessarily given a hoot about sports. Nothing has pleased me so much as when someone, usually a woman, writes me or tells me that she's appreciated sports more because NPR allowed me to treat sports seriously as another branch on the tree of culture. Thank you for listening. Thank you for abiding me. And now, ladies and gentlemen, boys and girls, children of all ages, I bid you goodbye and take my leave. INSKEEP: Oh, it's been an honor to introduce Frank, to see him in the hallway sometimes, a tall gracious guy often in a suit. When you meet Frank Deford, you're one degree removed from a half century of great athletes. All these years, Frank has given his opinions and, of course, not everybody agreed. In fact, people sometimes asked me, why do you keep playing that Frank Deford? Well, I'll tell you why - because he could tell a story. And because whether you agreed with him or not, you could tell that Frank Deford cared. (SOUNDBITE OF U137'S "VARBERG") Transcript provided by NPR, Copyright NPR.